Supplement with a powerful blend of micronutrients, multi-vitamins, and minerals. Muscle growth in athletes is not hindered by a lack of protein, as protein and amino acids are the most commonly used supplements. However, there is often an insufficiency of vitamins and minerals, which are harder to derive from the diet. Moreover, recent changes in diet due to changes in farming methods and soil quality has led to a decrease in vitamin, mineral, and enzyme content in food. Active athletes need to compensate for this lack of nutrients to maintain their strength for exercise. 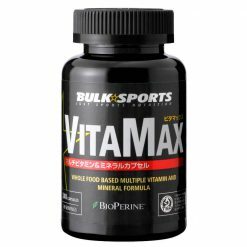 For this reason, it is highly recommended that athletes take high quality multi-vitamn supplements. There are many types of synthetic multi-vitamin and mineral supplements available on the market. However, the body does not react the same way to chemically engineered nutrients as it does to those taken from natural foods. This manner of compensation for mineral deficiency is cheap, but it certainly isn’t the best. And this is where VitaMax comes in. The major advantage of VitaMax is that it enriches vitamins and minerals from natural foods using an innovative technology. Most vitamins and minerals, with the exception of Vitamin D3, are plant-derived. These precious vitamins and minerals, and their excellent bioavailability have been studied for several decades. Research has shown that natural food complexes, which are incorporated in VitaMax , are better absorbed by the body than vitamins and minerals that have been synthetically isolated. In addition, vitamins and minerals from natural sources, such as those in VitaMax, remain active longer in the body than their synthetic counterparts. This is due to the synergistic effect of other nutrients in natural food, like enzymes and probiotics, which increases bioavailability. VitaMax is one of the few multi-vitamin and mineral supplements with naturally high bioavailability. VitaMax not only supplies the daily recommended mineral intakes, it also contains the healthy micronutrients that you need in a well-balanced diet. EVNol™ contains tocotrienol, which has been gaining attention in recent years as a “super vitamin E”. It is a product that contains all of the existing Vitamin E types. β- carotene: pro-vitamin A that is derived from the Dunaliella salina plant. Bioperine ®: contains piperine derived from black pepper extract. Promotes the digestion and absorption of vitamins and minerals. 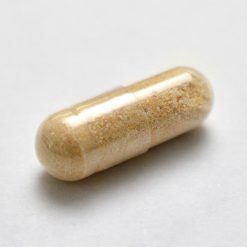 Probiotics: contains Bulgaria fungus to promote digestion. Also includes bioflavonoids, naringin, hesperidin, polyphenols, complex carbohydrates (beta- 1,3 -glucan, mannan), proteins, enzymes, dietary fiber, superoxide dismutase, and powerful co-factors such as the antioxidant glutathione. Take 4 capsules, 2 times daily.